Video | Desert Diamond Industries – Your Safety… Our Priority! You’ve probably seen decorative joints in concrete before, from faux paving stones to circular medallions. You may have even wondered how they’re made. After all, saw blades only cut in straight lines, right? According to Bob Harris of the Decorative Concrete Institute, not really. 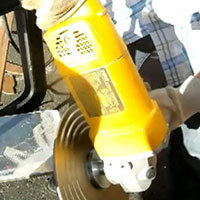 Harris shows you how to cut both round joints and precise straight joints with walk-behind saws and angle grinders in this ConcreteNetwork.com video. (You may remember him from another ConcreteNetwork.com video that we featured two weeks ago on cutting control joints in concrete). Since this is a video about decorative concrete, there’s also a section on dyeing and acid staining. Watch it now, and let us know what you think in the comments section. This entry was posted in How To, Video and tagged Concrete, Construction, How To, Video on September 24, 2014 by Desert Diamond Industries. Controlling respirable crystalline silica dust can prevent lung conditions like silicosis, COPD, tuberculosis, and lung cancer. The best way to do that, aside from wearing a respirator, is wet-cutting. However, wet-cutting has disadvantages: it’s messy and not suited for indoor cutting, not all saws are equipped for it, and cutting sites don’t always have access to water. Using a vacuum to control dust is less preferable to wet-cutting, but it has the advantages of being easier to set up and clean up. This video from ConcreteNetwork.com showcases three kinds of vacuums, from Shop-Vac-type vacuums all the way to HEPA filter-equipped monsters. Watch it now, and let us know what you think in the comments section. This entry was posted in How To, Safety, Video and tagged Concrete, Diamond Blades, How To, Safety, Video on August 13, 2014 by Desert Diamond Industries. How to Use an Angle Grinder Safely, by Power Tool Institute, Inc.
Of course, one safety measure that this video doesn’t mention is to use the Safety Blade Grinder/Cutter, which won’t break or shatter during grinding or cutting. Just thought we’d throw that in there. This entry was posted in Safety, Video and tagged Angle Grinders, Safety, Video on July 23, 2014 by Desert Diamond Industries. See You at the American Water Works Association’s ACE14 Convention! We’re going to the American Water Works Association‘s ACE14 convention in Boston, MA! Be sure to visit us in the exhibitor’s hall from June 8 to 11 at the Boston Convention & Exhibition Center. We’ll be showing off our full line of diamond blades and grinders there, including the Ductile Iron Ring Saw Safety Blade. Here’s a preview of that blade. Stay tuned here for more details! This entry was posted in General Information, Video and tagged ACE14, AWWA, Conventions, General Information, Video on April 30, 2014 by Desert Diamond Industries.